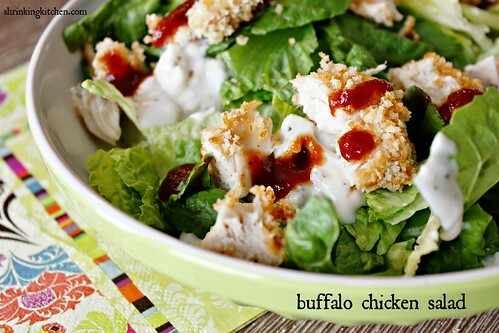 The chicken tenders featured in this buffalo chicken salad bring the bang of buffalo wings, without all the fat. My toddler loves them as finger-food, and my husband uses any leftovers to make lunch wraps. I’ve also included a homemade dressing, featuring fat-free buttermilk and yogurt tossed with fabulous no-fat feta cheese crumbles. Preheat the oven to 400 degrees. Whisk together the hot sauce, vinegar, sugar, and salt in a shallow dish until well blended. Add the chicken and turn to coat. Cover and marinate for 10 minutes at room temperature. Place the Panko and oil in a shallow dish and toss with a fork to combine. Roll each chicken tender in the Panko to completely coat. Transfer to the rack of a broiler pan. Bake, turning once, until chicken is cooked through, and Panko is golden brown in color, about 16 minutes. While the chicken bakes, stir together the feta cheese, yogurt, buttermilk, and pepper. Set aside. When the chicken is done, divide the lettuce among 4 plates. Top with chicken, drizzle with dressing to taste, and serve immediately.